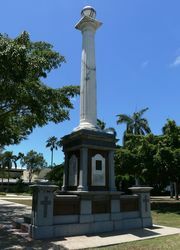 The Mackay Cenotaph commemorates the 159 men from Mackay and district who died in service or were killed in action in World War One. It was originally located on the banks of the Pioneer River opposite the Customs House however due to river floods and erosion of the river bank the memorial was relocated to the Gordon Street end of Jubilee Park in 1945. The cenotaph was once again relocated to its present location in March 1973 to make way for the construction of the present Mackay City Council Civic Centre. The foundation stone of the Mackay Cenotaph which was to be erected on the riverbank at a cost of £2000 was unveiled by the Mayor, Alderman Milton on the 18th November 1928 in the presence of a large gathering. Reverend Bardon of St Paul’s Presbyterian Church addressed the assembly and referred to great sacrifices made by those in whose honour the memorial was erected. In the years to come when children asked their parents “what mean ye by this stone” the story of the men who perished would be handed down from generation to generation.